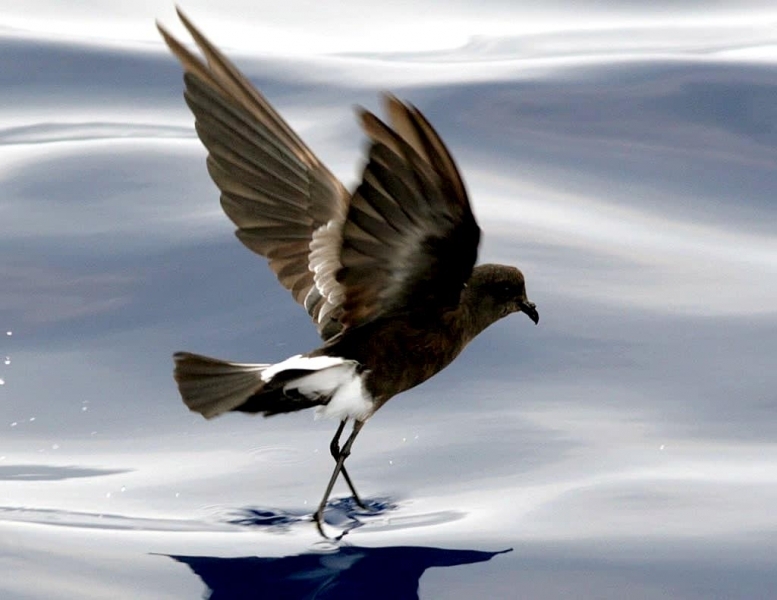 The Wilson’s Storm Petrel is a small seabird with short, rounded wings and long legs projecting beyond the tail in flight. 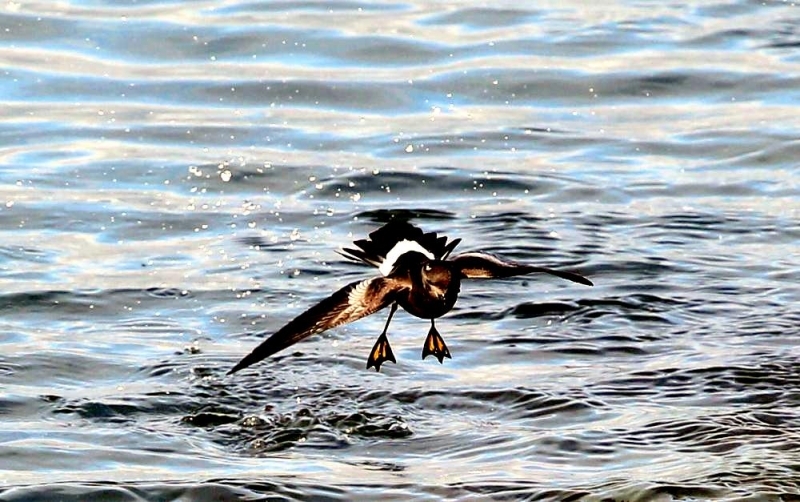 It is about 18 centimeters in length with a wing span of approximately 40 centimeters. 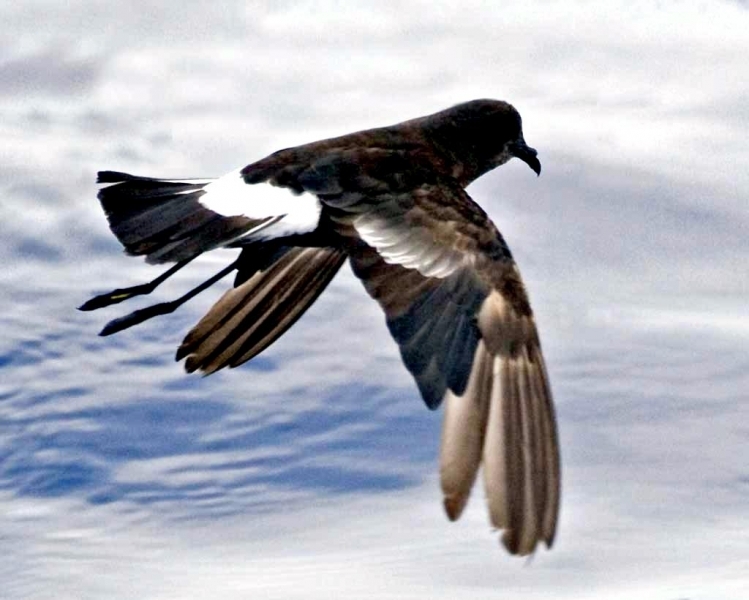 Their upper-parts are mostly sooty-brown except for a conspicuous white rump and a pale brown band showing across the greater wing-coverts. 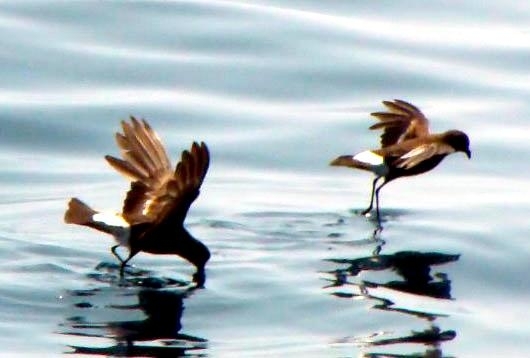 Their underside is mainly sooty-brown. 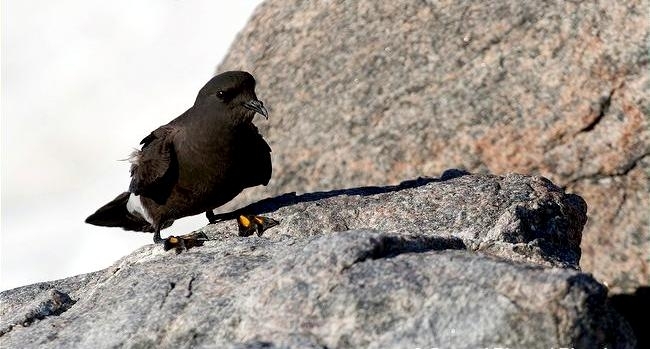 The bird is named after Alexander Wilson, a Scottish-American naturalist who is called the Father of American Ornithology. 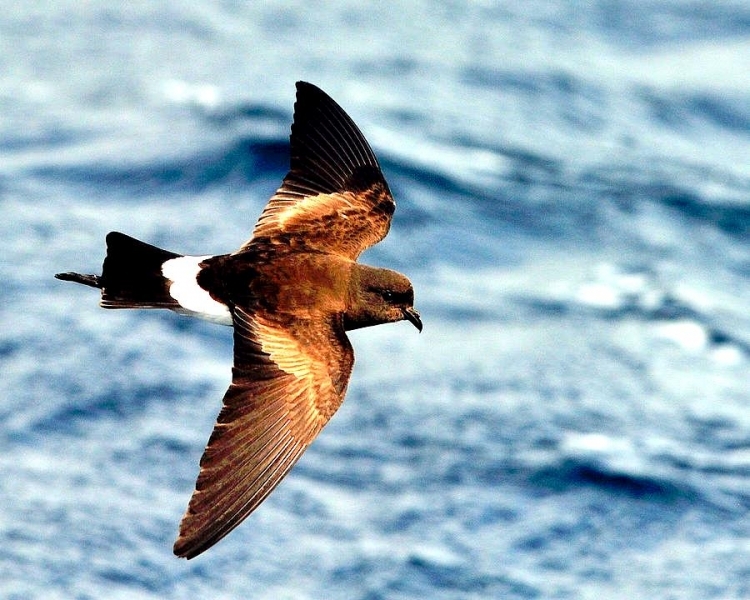 The name “Petrel” refers to Saint Peter and was given to the species because the bird’s hovering makes them look like they are walking on water. 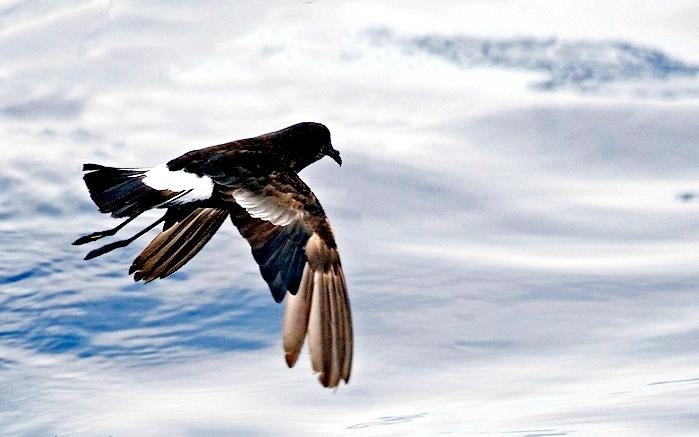 The “Storm” in the bird’s name refers to the idea that the appearance of flocks of the bird foretold of a coming storm. 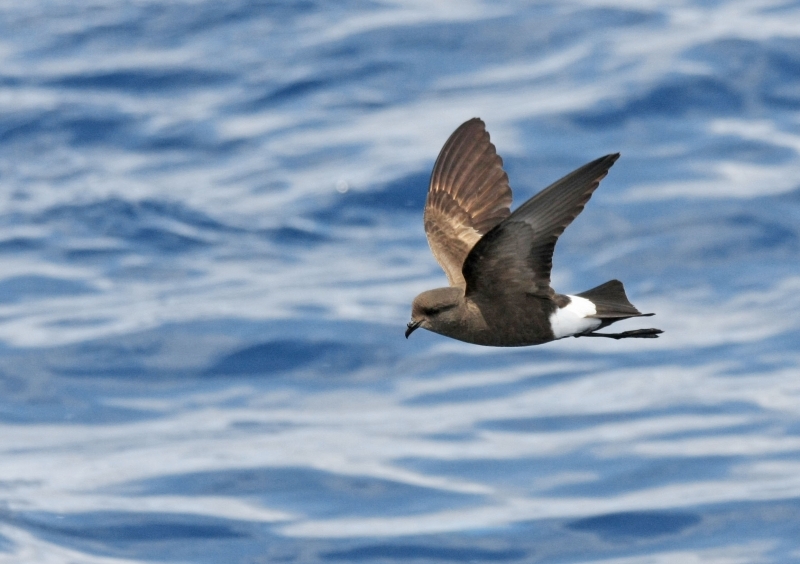 Wilson’s Storm Petrels are numerous & wide ranging. 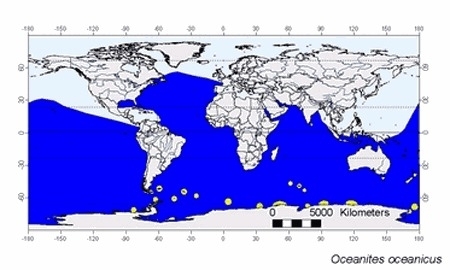 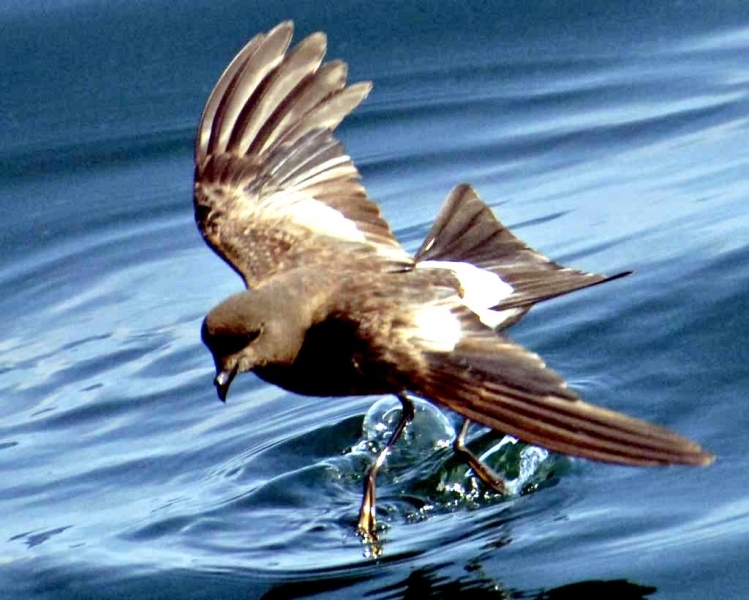 They migrate from their Antarctic breeding grounds to north of the Equator in the Atlantic, Indian and Pacific Oceans, with few birds migrating north into the eastern Pacific Ocean. 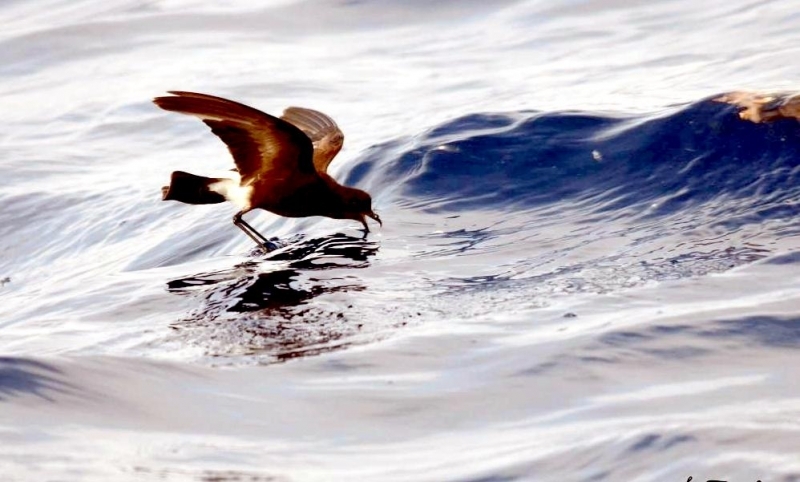 During storms at sea, Wilson’s Storm Petrels will fly in the troughs of waves in order to take some sort of cover. 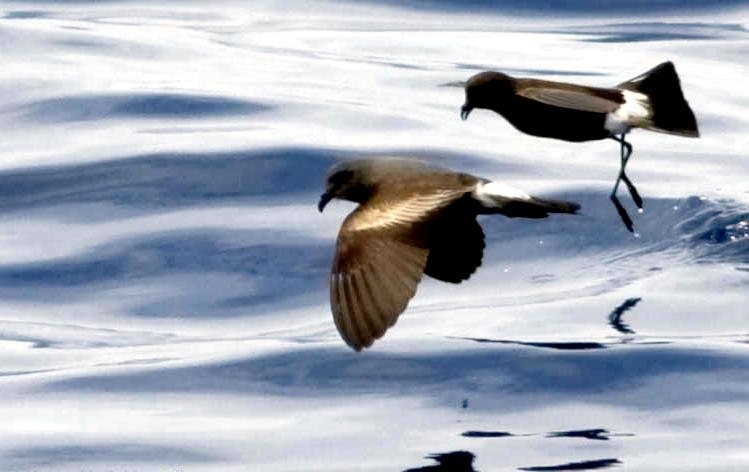 Wilson’s Storm Petrel breed on the Antarctic continent, South Georgia, Kerguelen, Falklands, Tierra del Fuego islands off Cape Horn and possibly also at Peter, Bouvet, Heard, the Balleny Islands and islands off Graham Land. 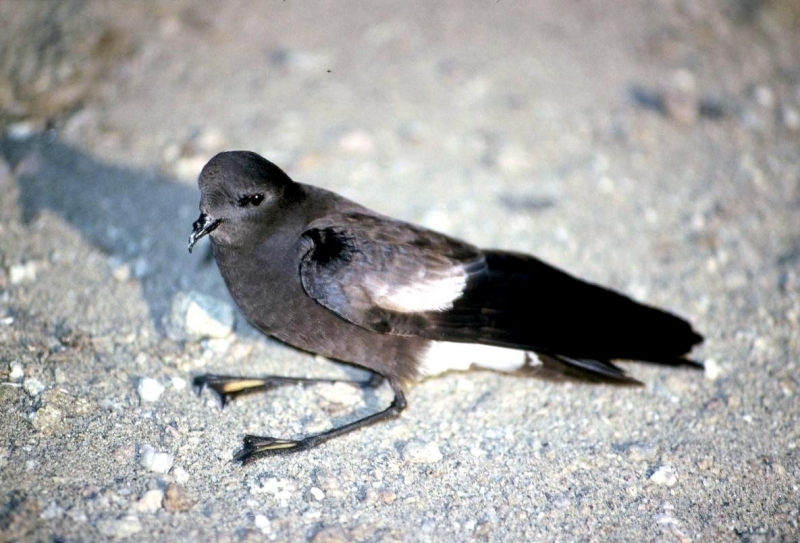 Non-breeders may remain in the north throughout the year. 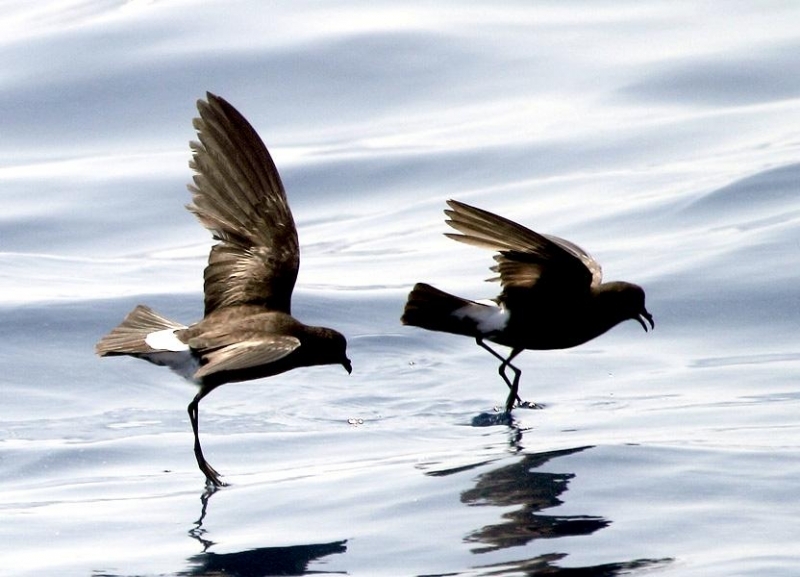 Wilson’s Storm Petrels are gregarious at sea with flocks reaching several thousands at staging points during migration. 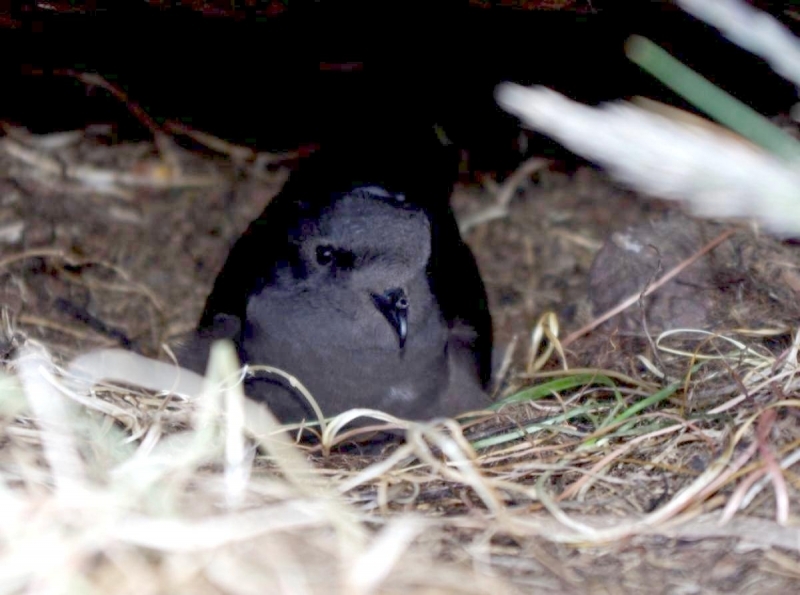 Wilson’s Storm Petrels return to their colonies in November/December and eggs are laid in mid-December (approximately 1 month later at Heard Island and Iles Kerguelen). 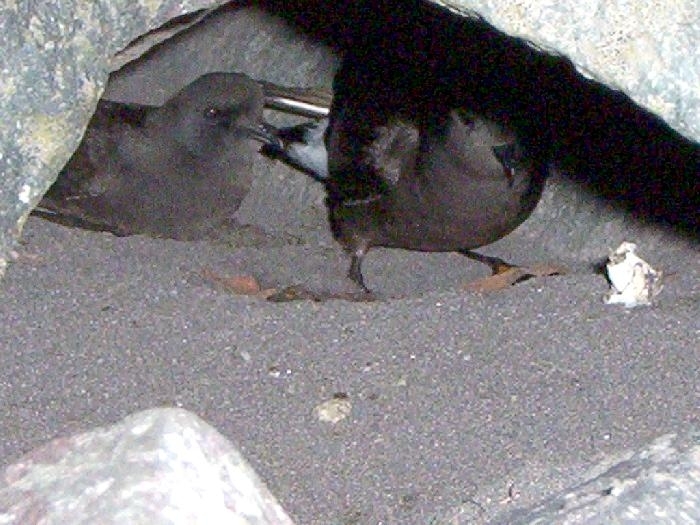 Both parents share the 39 to 48 day incubation period, taking alternative shifts of about 48 hours. 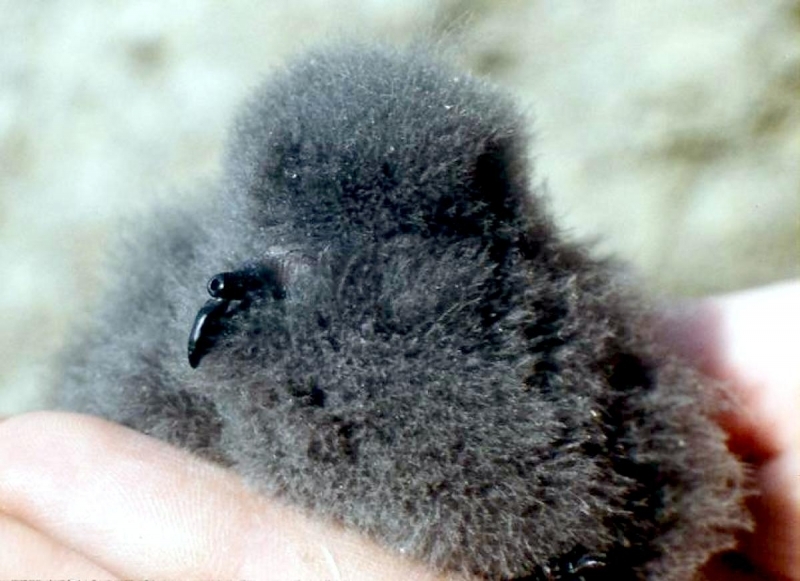 Once the chick hatches, it is fed irregularly by both parents for up to 52 days. 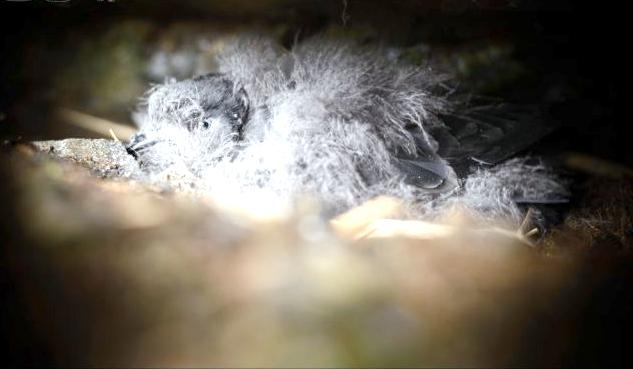 Fledgling and dispersion begins in April/May. 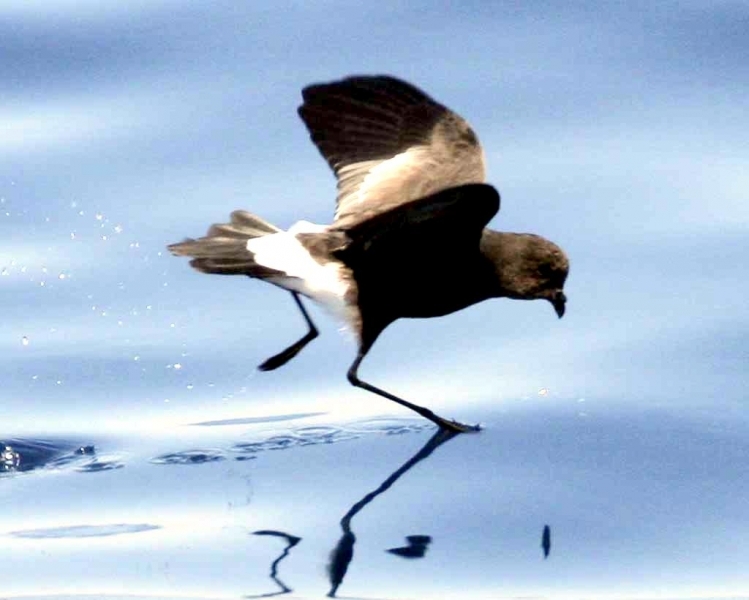 Wilson’s Storm Petrels feed by running along the surface of the water with wings outstretched and the bill or their entire head submerged in the water to scoop in their food, taking minutiae from the surface. 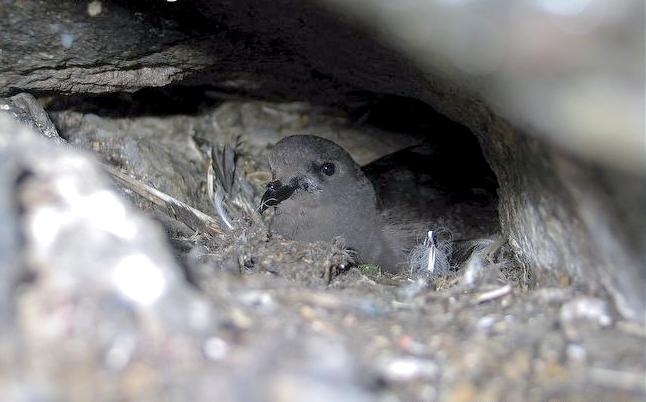 At nesting sites, Wilson’s Storm Petrel chicks are sometimes killed by starvation due to the blocking of the burrow by hard snow. 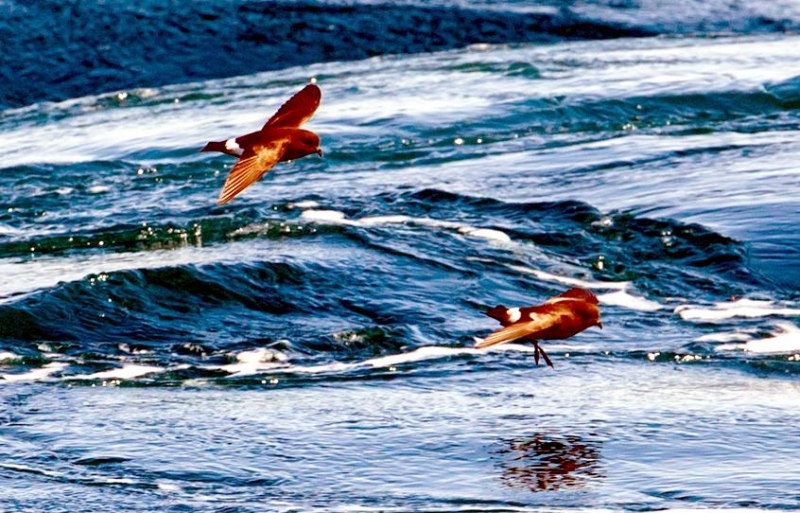 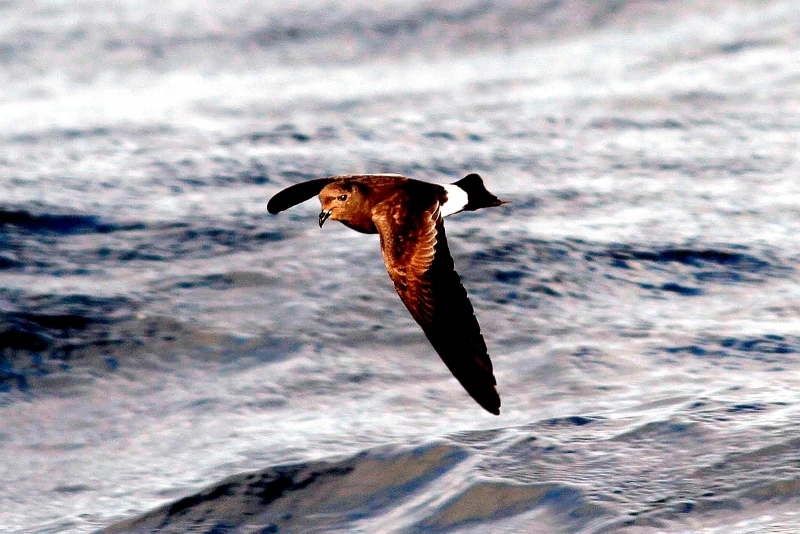 Despite its small size and seemingly weak flight, this bird is at home on the roughest of seas, flying in the troughs of the waves during gales. 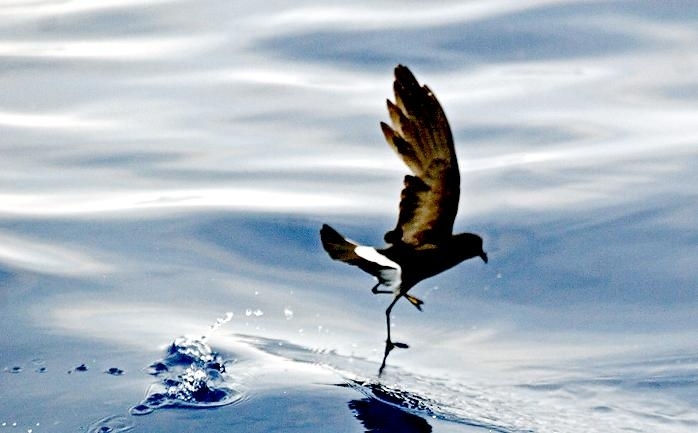 It also travels huge distances, from the Antarctic to the edge of the Arctic. 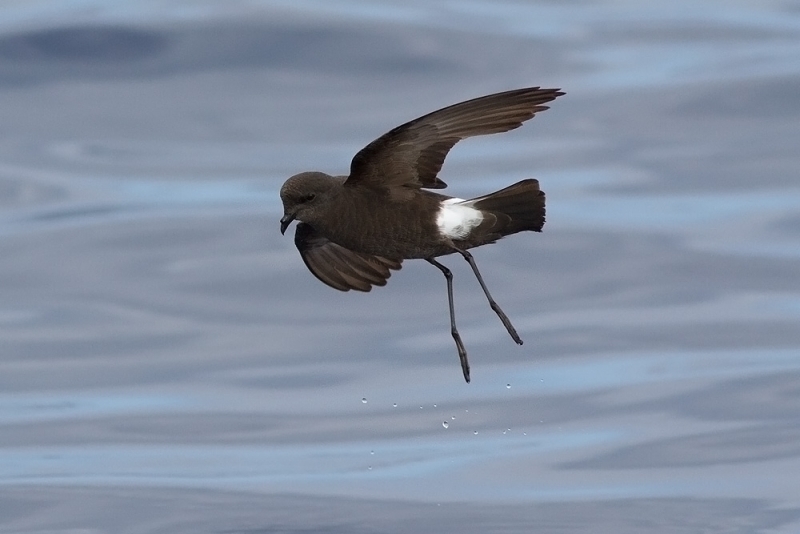 Although it nests only in far southern oceans, Wilson’s Storm-Petrel is often the most common seabird off the Atlantic coast of the United States. 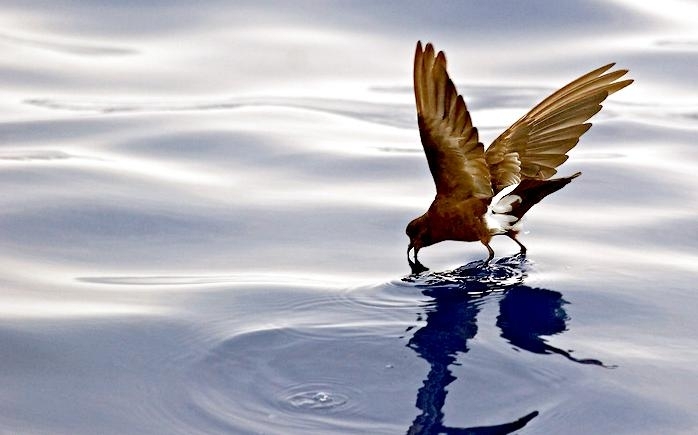 They take food from surface of water by foraging by hovering with their feet touching water and picking at surface with bill also by dropping into water and then resuming flight, sometimes by picking at items while swimming. 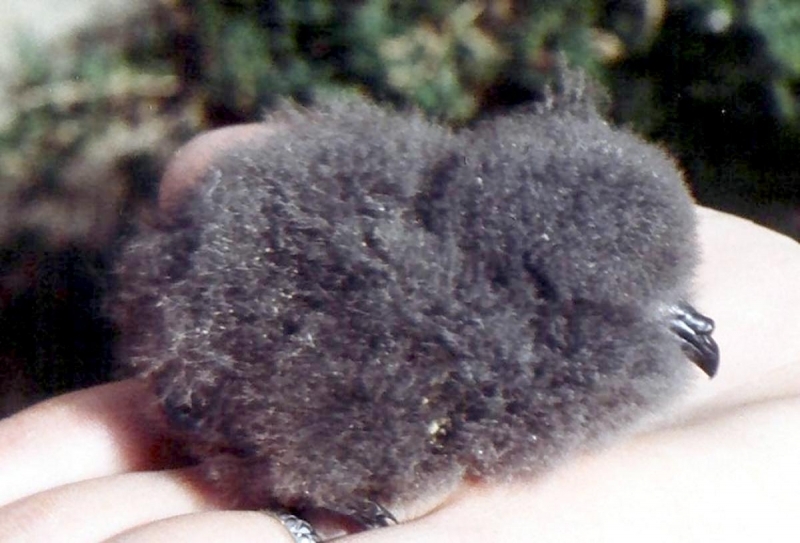 Females lay 1 white egg, usually with reddish-brown dots at larger end. 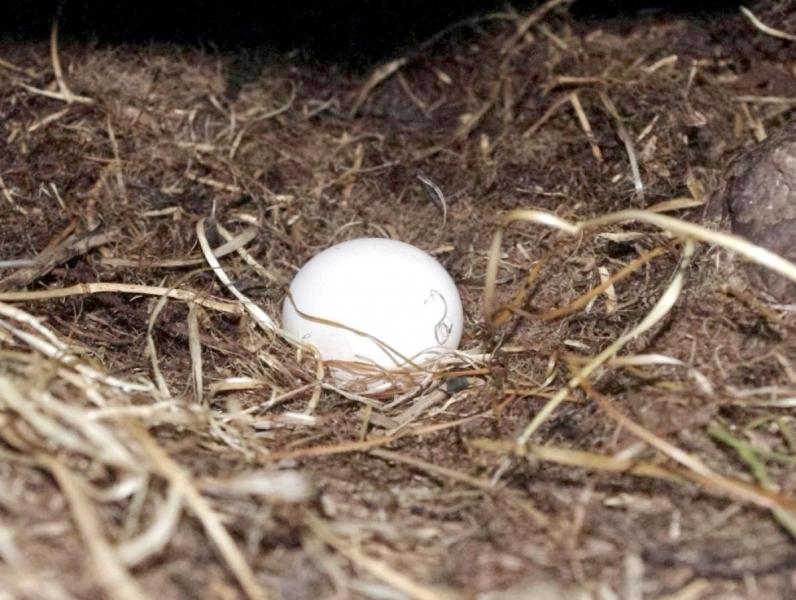 Incubation is by both sexes, usually 40 to 50 days. 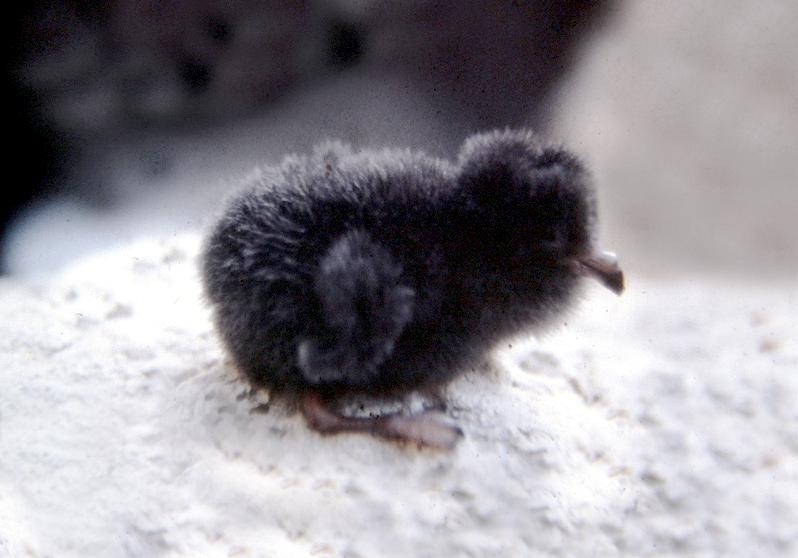 Chicks are fed by both parents. 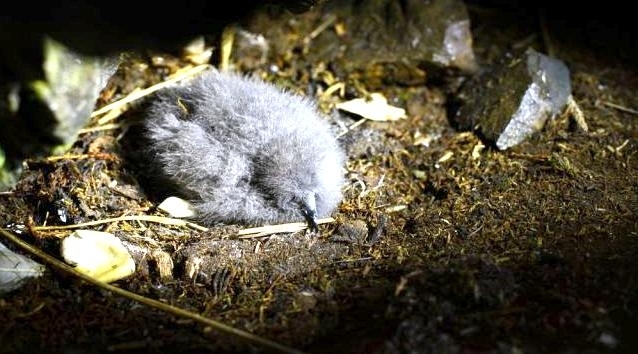 Period from hatching to departure from nest (46-97 days) varies considerably, probably depends on rate of feeding. 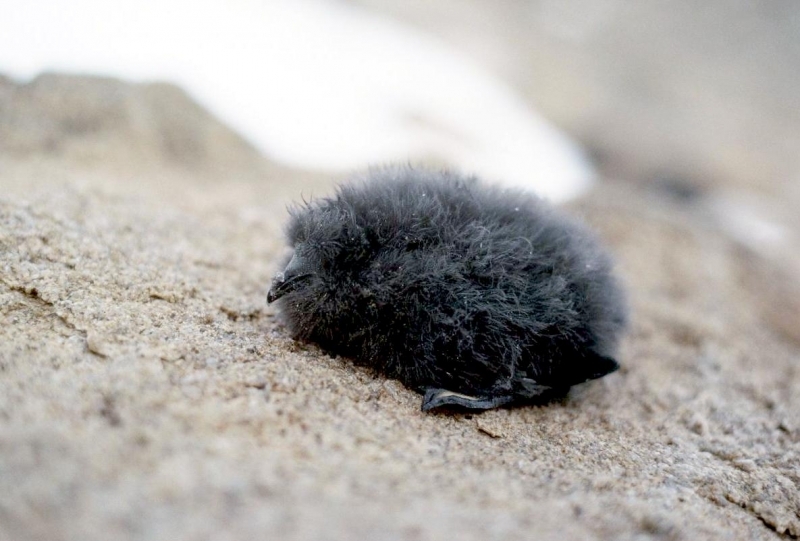 The chick is independent of parents after leaving nest and going to sea. 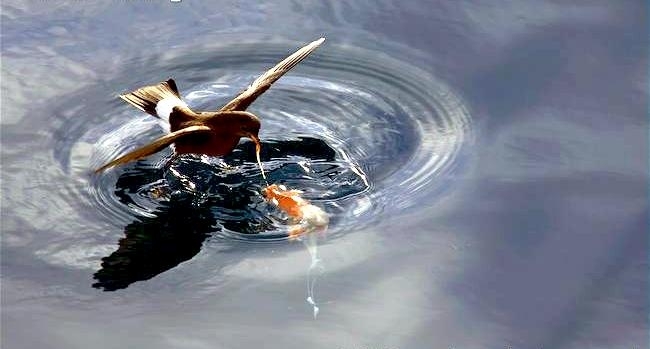 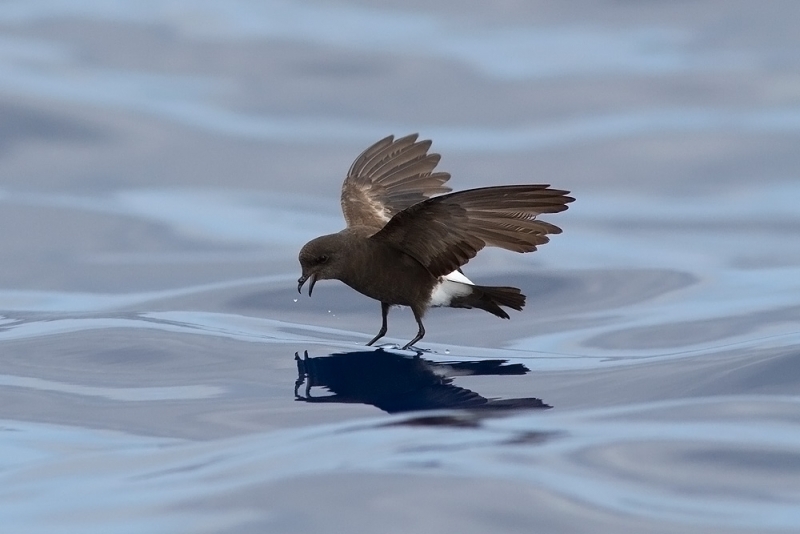 Wilson’s Storm-Petrels feed mainly on crustaceans (especially euphausiid shrimp and amphipods), small fish, squid, marine worms as well as other small organisms. 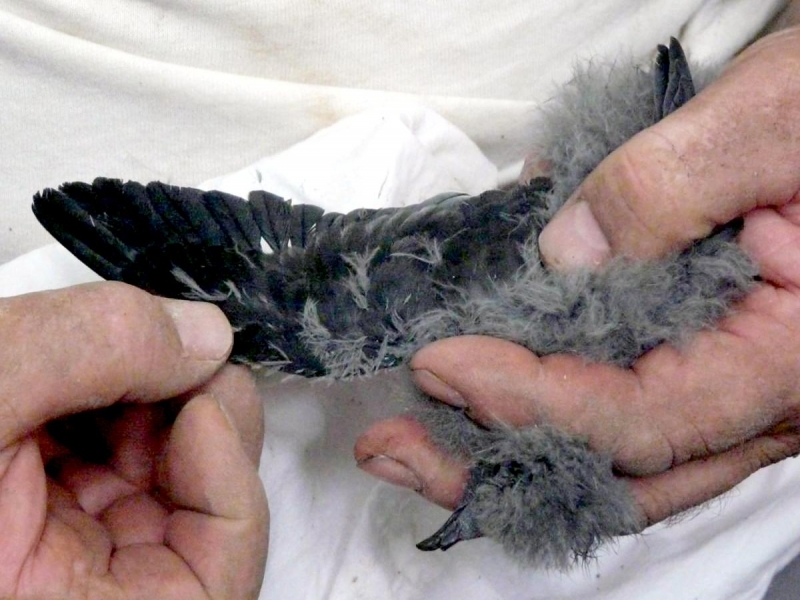 They will also scavenge at natural oil slicks & carrion and will follow ships to pick at offal. 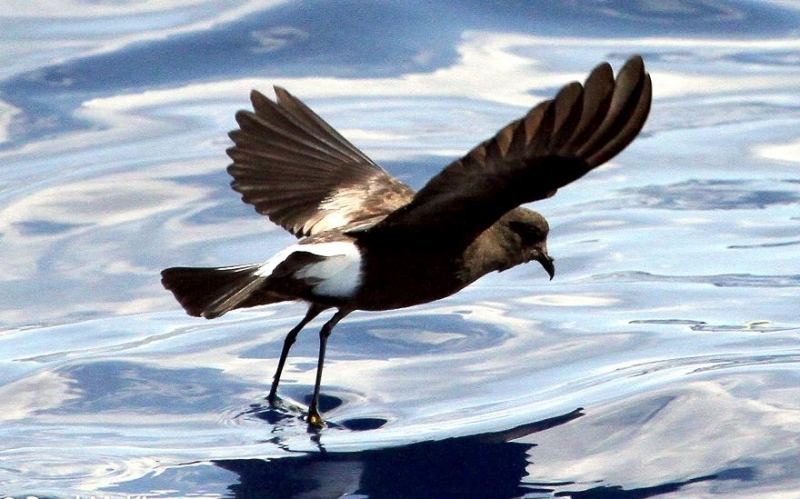 Wilson’s Storm Petrels can live for up to 20 years in the wild and estimates put the worldwide population at over 30 million individuals. 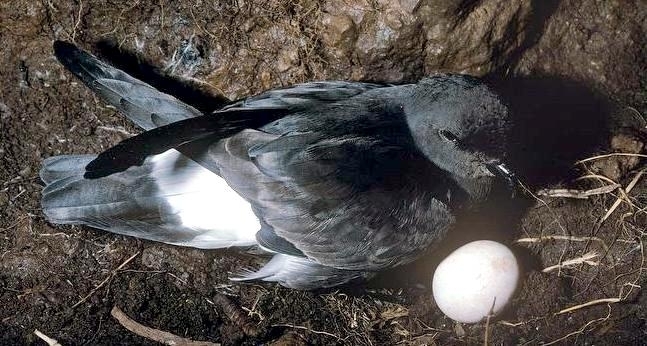 Wilson’s Storm Petrels young & eggs are preyed upon by skuas, gulls, owls and falcons and because of their small size, adults may also be taken by falcons.